There are lots of different types of bras so here I will explain about them and which one's right for you. The next type of bra is a padded bra it doesn't have an underwire. If you feel your trainer bra isn't giving you enough support then you should move up to a padded bra. It looks like this. There are also padded bras with an underwire. The underwire helps give you more support. Most girls, teenagers and women wear padded bras with an underwire as an everyday bra once their breasts have fully developed.If your padded bra isn't giving you enough support then try and underwire bra. Underwire bras look like this. There is also a sports bra. 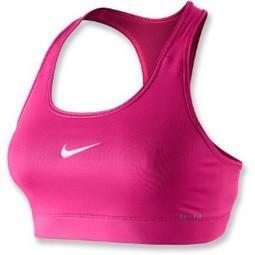 Sports bras are designed to hold your breasts still while doing sports that involve a lot of movement. They look like this. If you feel your everyday bra doesn't give you enough support when playing sports you should try a sports bra. There is no set time to wear a bra. The pictures I've given are just examples. If you never feel the need to wear a bra then you don't have to wear one. Some women live their whole lives without bras! If you think you need a bra ask your mum to take you shopping and if you still have doubts then you can get a professional to fit you. Otherwise the best way to choose a bra is to try lots on and find the one that fits you best. Q: When should I start wearing a bra? A: This is totally up to you! Most girls begin wearing a bra when their breasts start to hurt when they run around, but some girls just start wearing bras because their friends are. You can start with a trainer bra or go straight to a padded bra because there's no right or wrong way! If you want a bra buy one! Q: How do I tell my parent I would like a bra? A: This is often a question girls are afraid to ask their parents much like asking to use tampons. Once again there is no right or wrong way and you're the one who knows your parent best. Here are a few things you can try. ♥ If you have an older sister who already uses bras you can tell her and get her to talk to your mom or dad. ♥ Tell your parent in the car, that way you don't have to look directly at them! It makes things way less awkward! - While your clothes shopping "hey mom, can we have a look at some bras?" - In the car "do you think that one day we can go bra shopping, my breasts are starting to hurt when I run around." - In the car "lots of girls at school have bras, do you think I could get one too?" - When you feel most comfortable with your mom "mom how old were you when you started wearing a bra?" ♥ Keep your tone of voice calm and relaxed. Some parents find it awkward to talk about these things which may be why they haven't brought the subject up with you before so keeping a calm tone will help make everyone feel comfortable. ♥ Try telling one parent. Having both of them there can feel overwhelming. ♥ Text them! They'll understand you were embarrassed to ask in person and won't ask questions! ♥ Don't worry, your parent will understand! They're not going to forbid you from buying a bra!